Program Format: Combo In-School Performance & In-School Workshop Program Format Info: In-school performance (intended for the entire grade level to experience together. Materials School Provides: Photo copies of written material provided by the artist. Space and/or Set Up Requirements for Program: 2 microphones and non-carpeted surface for dance performance. 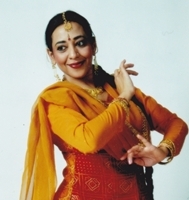 Program Learning Objective: I can determine the nature of Kathak dance movements and their effects on a choreography. I can interpret how the movements and moods of Kathak reflects the culture where it has come from. I can explain how the economic decisions and cultural patterns affect the environment and daily lives of people in India. Program Description (Grade Level Program): Through the process of learning culture and dances of India students will learn how a nation’s arts reflect its culture and history. The dance style of India that students will be learning is called “Kathak”. Kathak is one of the leading forms of classical Indian dance. Like many aspects of the cultural life of northern India, Kathak developed through various phases of Indian social and political history. I will perform Kathak, North Indian classical dance form for students. I'll present different ways to produce sounds from feet and the bells, vocalization technique of Kathak dance, an expressional piece involving body language, facial expressions, and hand gestures. The program will be 45 minutes long, where students will have an opportunity to participate and ask questions. On the following days, students will learn Indian dance movements and underlying four principles such as space, time, energy, and movements including balance, alignment, weight etc. Students will understand how dance creates and communicates meaning through body, hand, and facial gestures. Students will learn how this integrated art form reflects India’s complex history and Persian and British influences due to their political invasions in India through the dance movements and classroom discussion. At the end of residency students will have the opportunity to perform a full-length dance piece and reflect on what they have learned over the past three days. A detailed plan for each day is available once selected. Program Description (Arts/PE Program): Through the process of learning culture and dances of India students will learn how a nation’s arts reflect its culture and history. The dance style of India that students will be learning is called “Kathak”. Kathak is one of the leading forms of classical Indian dance. Like many aspects of the cultural life of northern India, Kathak developed through various phases of Indian social and political history. On the following day, students will learn Indian dance movements and underlying four principles such as space, time, energy, and movements including balance, alignment, weight etc. Students will understand how dance creates and communicates meaning through body, hand, and facial gestures. Students will have the opportunity to perform a full-length dance piece at the end of the program. Parent Engagement Opportunities: Volunteers are welcome to assist with the performance. Grade 6 : Geography :Human-Environment Interaction: Places, Regions, and Culture: 6–7.3 Explain how cultural patterns and economic decisions influence environments and the daily lives of people. Grade 6: Physical Education: Standard 2: The physically literate individual applies knowledge of concepts, principals, strategies and tactics related to movement and performance. Grade 6: Dance: Creating: Anchor Standard 2: Organize and develop artistic ideas and work. B. Define and apply artistic criteria to choreograph a dance that communicates personal or cultural meaning. Discuss how the criteria clarify or intensify the meaning of the dance. Grade 6: Dance: Connecting: Anchor Standard 11: Relate artistic ideas and works with societal, cultural, and historical context to deepen understanding. A. Interpret and show how the movement and qualities of a dance communicate its cultural, historical, and/or community purpose or meaning. Grade 7: Geography :Human-Environment Interaction: Places, Regions, and Culture: 6–7.3 Explain how cultural patterns and economic decisions influence environments and the daily lives of people. Grade 7: Physical Education: Standard 2: The physically literate individual applies knowledge of concepts, principals, strategies and tactics related to movement and performance. Grade 7: Dance: Creating: Anchor Standard 2: Organize and develop artistic ideas and work. B. Determine artistic criteria to choreograph a dance study that communicates personal or cultural meaning. Based on the criteria, evaluate why some movements are more or less effective than others. Grade 7: Dance: Connecting: Anchor Standard 11: Relate artistic ideas and works with societal, cultural, and historical context to deepen understanding, A. Compare, contrast, and discuss dances performed by people in various localities or communities. Formulate possible reasons why similarities and differences developed in relation to the ideas and perspectives important to each social group.